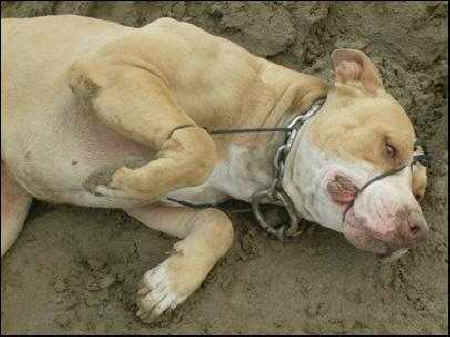 This pitbull was found in a field south of Bakersfield, hogtied with boot lace bindings and a heavy chain around his neck. Photo courtesy of Kern County Animal Control. 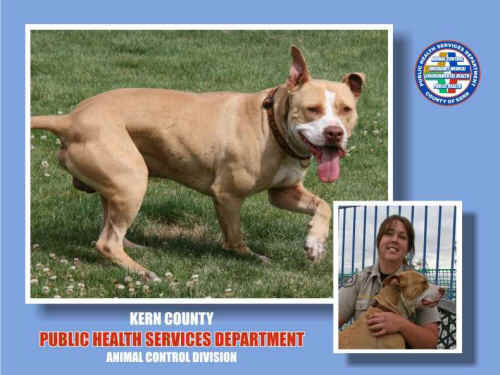 A pitbull was found hogtied, lying in a muddy field south of Bakersfield off Adobe Road near Sandrini Road by an animal control officer on Thursday, April 22. The boot laces were bound so tight that they dug into the dog's mouth and cut off the blood flow to his legs, causing them to swell. The animal was unable to move and suffered injuries due to the abuse. Reportedly, when the bindings and the heavy chain from around his neck were removed, the dog was friendly and showed no aggression. Shaw estimated that he had been abandoned, tied-up in the field for 4-5 hours. Thankfully, "England" was found in time. He was named after his rescuer, Officer Kristen England.